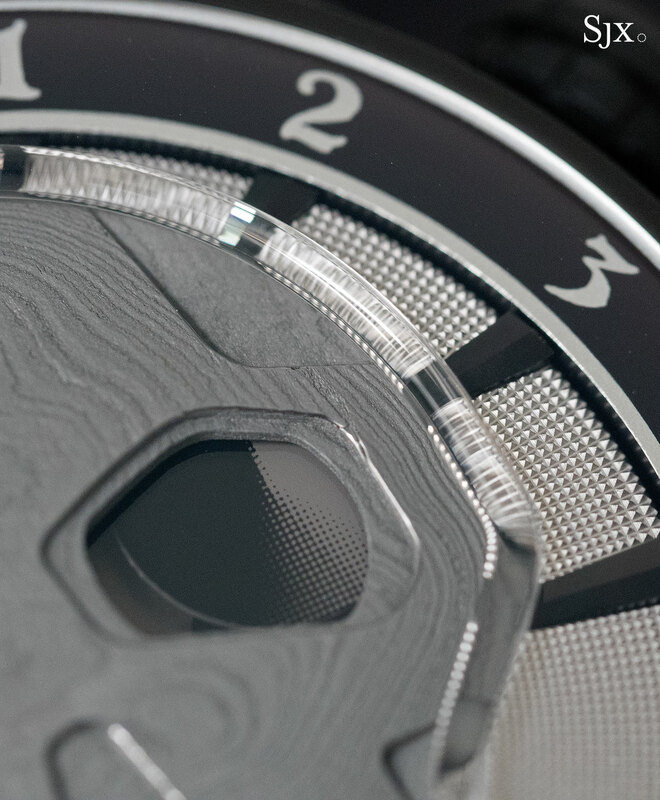 Made of folded steel and carbon, the dial reveals the graining typical of Damascus steel. Damascus steel is an ancient alloy, perhaps as old as Alexander the Great, used to make blades so deadly that legend has it a sword of Damascus steel can halve a piece of floating silk. Damascus steel blades were produced in the Middle East with wootz steel, a high carbon steel allot imported from India, and used by both Ottoman conquerors and Crusaders. Production of the metal stopped in the mid 18th century, and the technique of producing Damascus steel has since been lost to time. Researchers have not been able to duplicate the production process, though a recent study indicates the qualities of Damascus steel are due to carbon nanotubes. A key characteristic of Damascus steel, besides its mythical sharpness, was the striping and marbling on the surface of the metal, a result of the carbides in the alloy. The same pattern has been reproduced in modern day pattern welded steel, which is confusingly also known as Damascus steel. 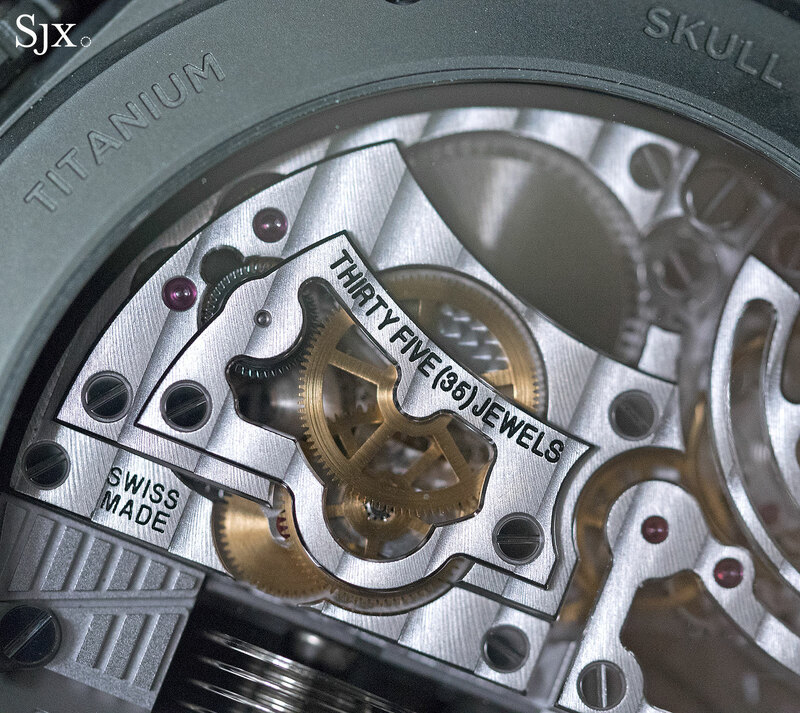 This metal is often used in high-end custom knives, and also the material for the dial of the HYT Skull Bad Boy, a luxe version of the original Skull. Modern Damascus steel is created via forge welding: joining different types of metal by heating them till red hot and then hammering the pieces together. Done repeatedly while twisting and folding the material results in the banded pattern like that on ancient Damascus steel. 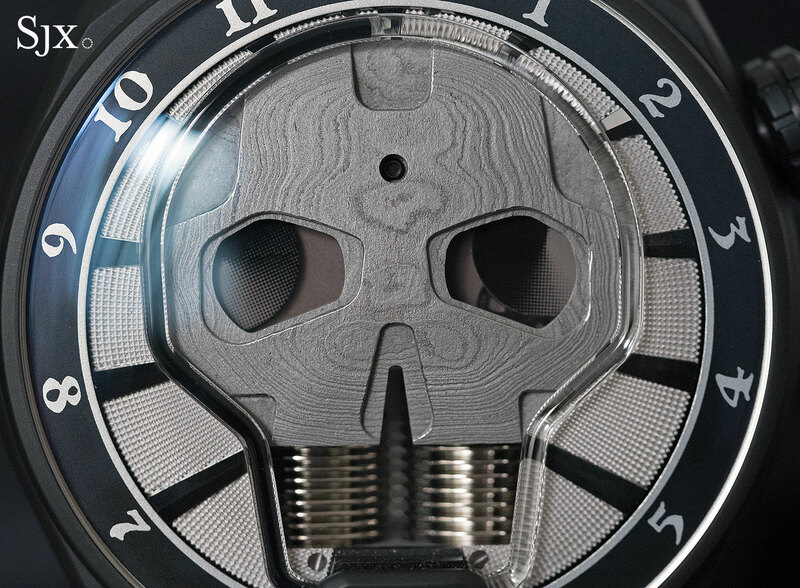 Produced by a foundry located in HYT’s home town of Neuchâtel, some 256 folds of the material are needed to create the modern Damascus steel used on the Bad Boy Skull. 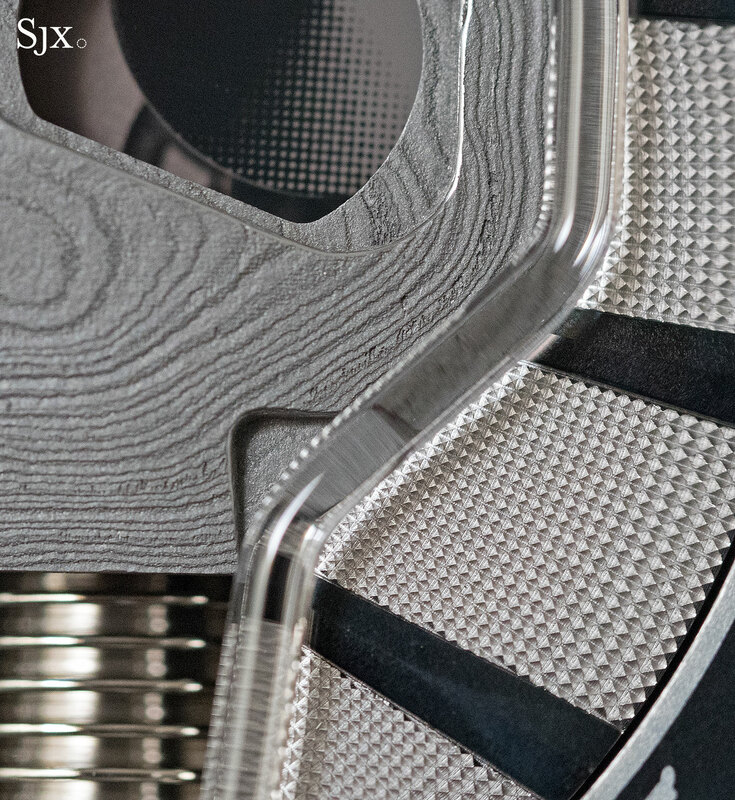 The Damascus steel is produced in bars, each enough for five dials, which are then cut and milled into the centrepiece of the dial. The skull is in turn framed by two rhodium-plated brass plates finished with a prominent hobnail, or Clous de Paris, pattern. Up close the metal is intriguing. Left unpolished and raw, the skull is seemingly hewn out of rock, with a rough, grained finish. The texture of the surface invites you to touch it. Even the layers of the folded metal that evident on the flanks of the material appear like striations on stone. These are obvious on the edges of the apertures cut out for the eyes and nose of the skull. 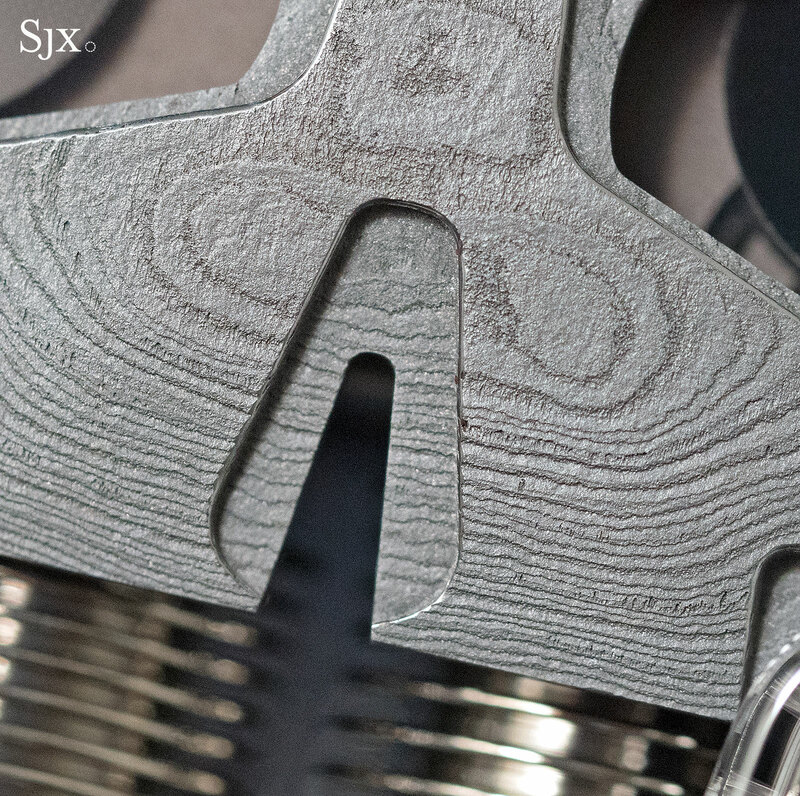 Though the Damascus steel is unpolished, it is treated to enhance the banded pattern with a technique known as acid etching. That involves immersing the metal in acid, which reacts differently to the various constituents of the material, darkening the banding to highlight the pattern. And to prevent rusting, a risk with such alloys due to the high carbon content, transparent varnish is applied to protect the metal. 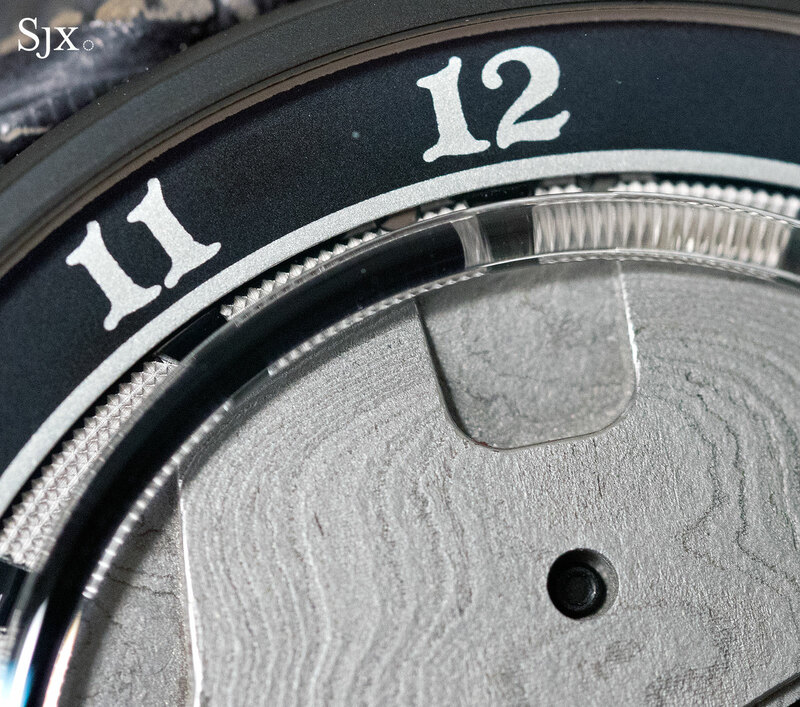 Mechanically the Bad Boy is almost identical to the H1, the first wristwatch introduced by HYT. It tells the time via glass tube filled with two immiscible liquids, one black and the other clear. The meniscus of the liquids point to the hours; there is no seconds hand so the time is approximate, to the nearest 15 minutes. A pair of bellows visible at six o’clock pushes the black liquid clockwise as the time passes. When it reaches six, the black liquid instantly rushes back to zero, and starts over. The generality of the time indicated is actually more coherent with the liquid time display, since it is both novel and inexact. This is less a watch than a philosophical reflection on the passing of time, just like the Speake-Marin Veshelda. While there are no minutes, there is a seconds hand to show that the watch is running. The left eye contains the seconds, in the form of a black and grey shaded disc. And in the right eye a similar disc acts as the power reserve indicator, with black meaning the mainspring is nearly wound down. 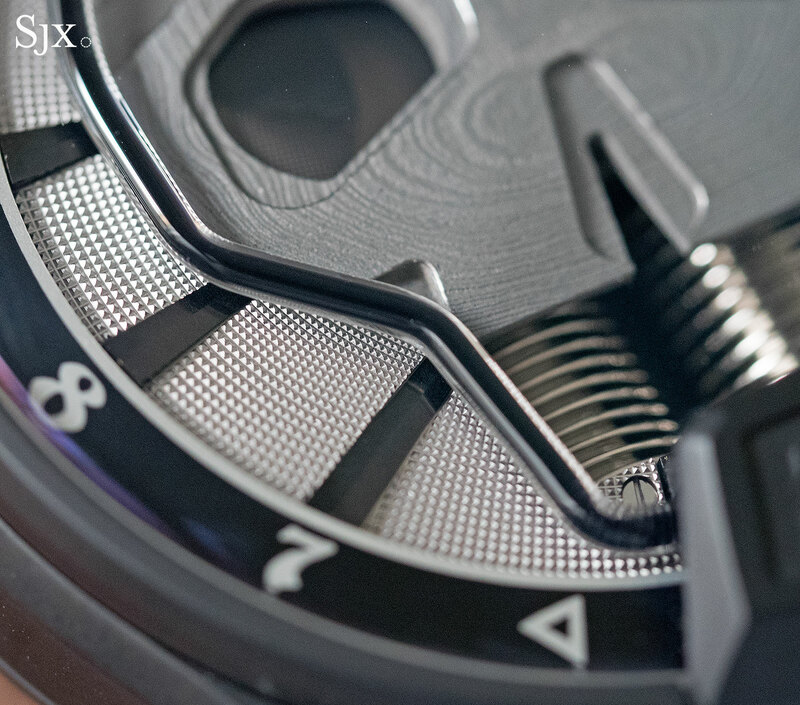 Typical of HYT, the case is chunky and large, being 51mm in diameter. 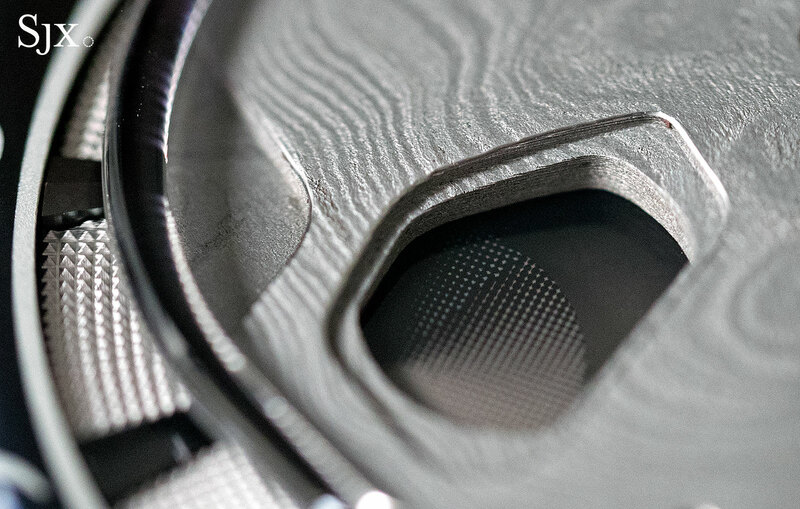 The case is titanium coated in diamond-like carbon (DLC), which aids comfort since the metal is lightweight. And the short lugs also help it sit well on most wrists. A grey tinted sapphire back reveals the hand-wound calibre. 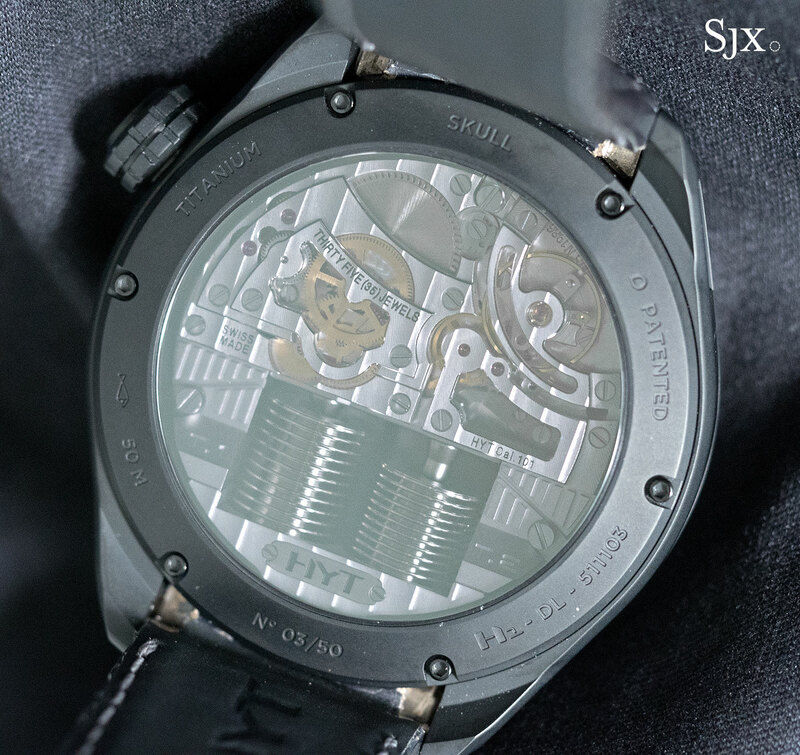 While the liquid pumping mechanism was constructed by Preciflex, HYT’s sister company specialising in fluid delivery, the timekeeping component was devised Chronode, a complications specialist also responsible for the movements in the MB&F LM1 and the crowdfunded Czapek & Cie. wristwatch. 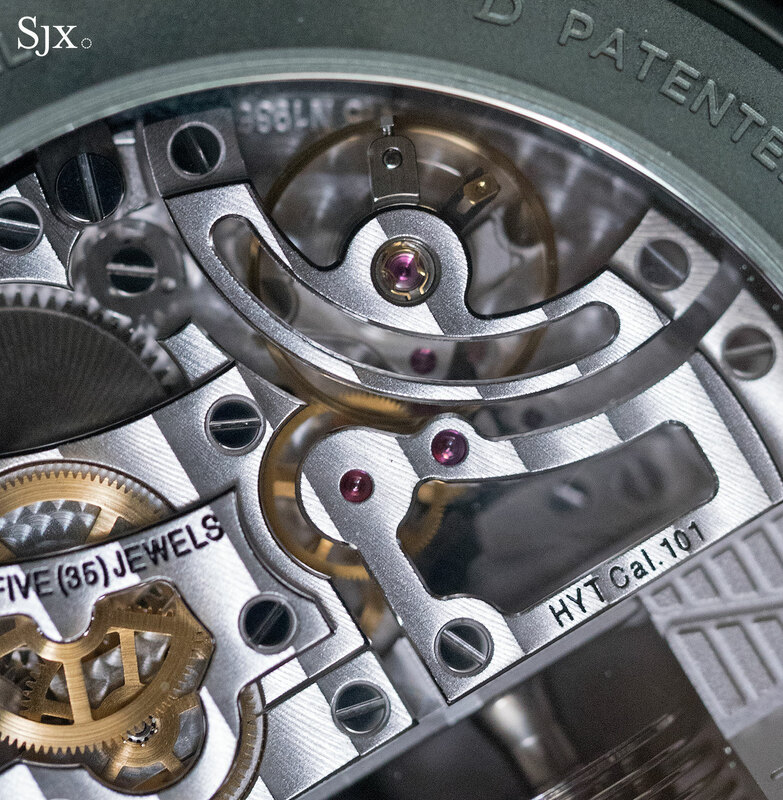 The finishing of the movement is typical of many watches in this genre, where the movement decoration is never the key attraction. That means it is carefully and attractively done, revealing machine applied finishing but with refinements and final touches done by hand. 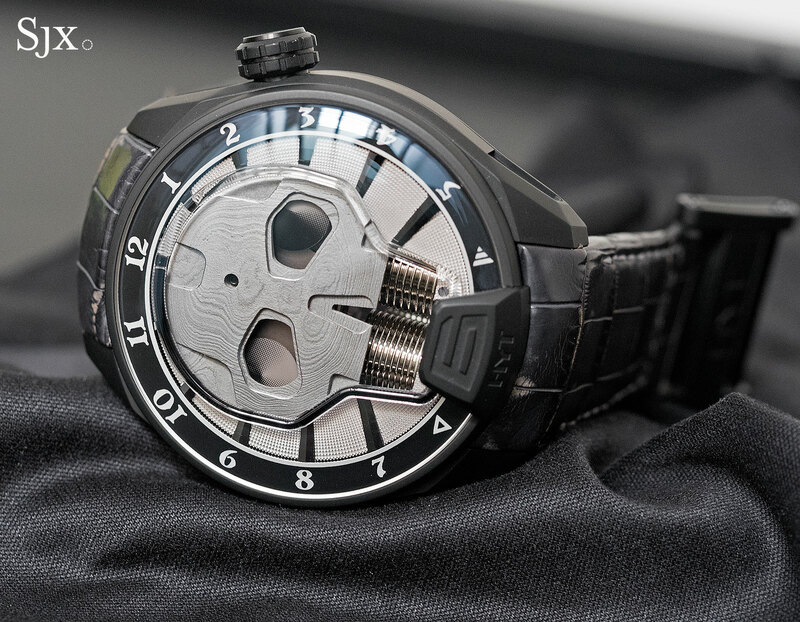 The Skull Bad Boy is a limited edition of 50 watches, priced at US$95,000 or S$125,000, and available from HYT retailers. HYT is an advertiser on Watches By SJX. 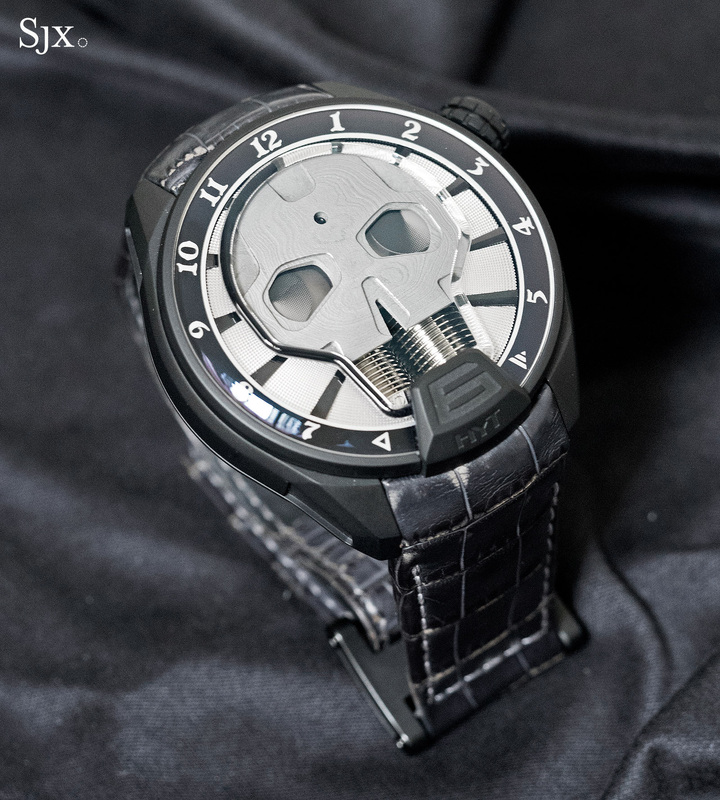 MB&F collaborates with Black Badger to create a limited edition, glow-in-the-dark HMX. You'll find opinions, specs and pricing below.